WASHINGTON (March 22, 2012) -- It's not enough to simply treat post-traumatic stress disorder; the Army recognizes the importance of preventing it from happening in the first place. During testimony before the House Armed Services Committee, subcommittee on military personnel, March 21, Army Surgeon General Lt. Gen. Patricia D. Horoho told lawmakers the service is now focusing on more prevention. 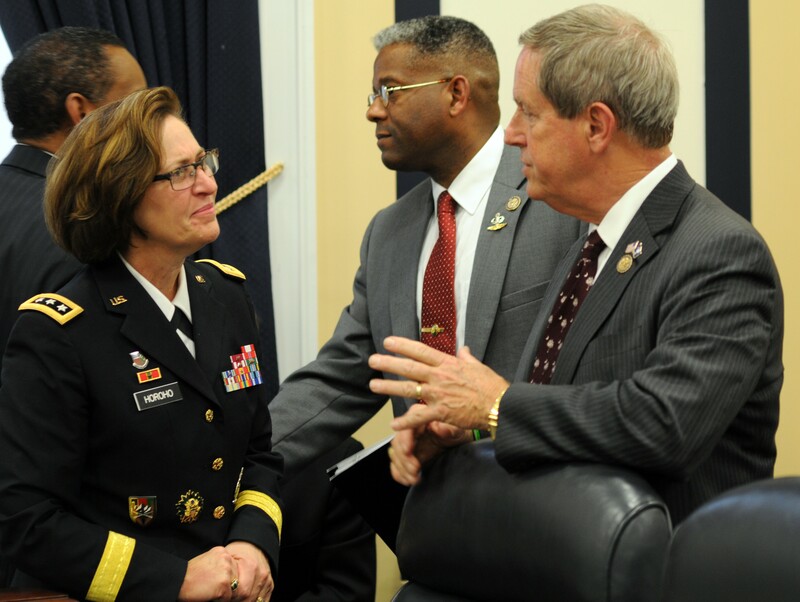 Army Surgeon General Lt. Gen. Patricia D. Horoho meets with Congressman Joe Wilson following a hearing of the House Armed Services Committee, subcommittee on military personnel, March 21, 2012. Horoho told lawmakers the Army has Soldiers see a behavioral health specialist before deploying, for instance. And in theater, there has been an increase in behavioral health assets made available to Soldiers. "We're using tele-behavioral health, so that instead of waiting until they redeploy back to deal with some of the stressors and the symptoms associated with deployment, they are able to do that through tele-behavioral health in some of the most remote areas in Afghanistan," Horoho said. Stateside, she said, the Army has also ensured the availability of behavioral health specialists through telemedicine. "We've over-hired across each of our regions using tele-behavioral health so that we can shift that capability where the demand is," she said. The Army is also emphasizing stress reduction and anger management, as well as looking at how Soldiers use alcohol, Horoho told legislators. "The approach now is more towards that prevention and looking at incorporating mindfulness, yoga, acupressure, acupuncture, so that we really help with decreasing some of that stress," Horoho said. "We've [in the past] focused more on treatment, and over the last couple of years it's been more toward prevention, we have a ways to go." The general also told lawmakers that medical advancements developed during ten years of combat in Afghanistan and Iraq are being brought home to the United States. "The best trauma care in the world resides with the U.S. military in Afghanistan and Iraq," she said. "The Army Medical Service is focused on building upon these successes [from] the battlefield as we perform our mission at home." The general also said the effectiveness of joint medical efforts in theater spells out a roadmap for the future of military medicine. "We are at our best when we operate as part of the joint team and we need to proactively develop synergy with our partners as military medicine moves towards a joint operating environment," she said.